BRISTOL - Washington, D.C. had the hot start, but it was Maryland that had the strong finish. 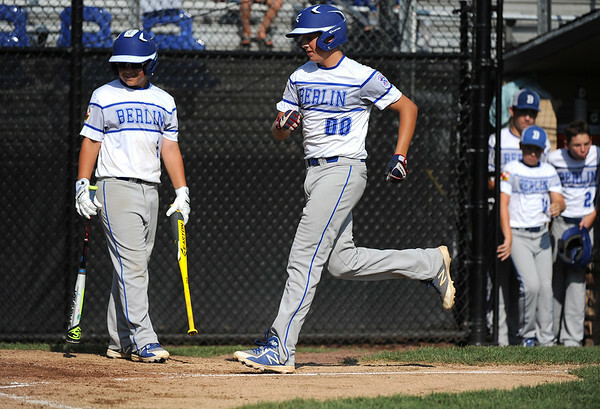 After putting up a five-spot in the first inning, D.C. fell flat and Maryland responded, scoring 16 of the game’s final 18 runs, in a 18-7 victory in the Little League Mid-Atlantic Regional at Breen Field. The loss brings Washington’s season to an end. D.C. scored four of the seven runs off Maryland starting pitcher Kannon Cropper, who failed to get a single out in the game. Foster Smith came in the game for Cropper, lasting four innings and giving up two runs. Adam Gardner surrendered the last run in his two innings on the mound. Maryland took the lead for good with a four-run third inning and scored at least two runs in every inning. Lukas Loring scored on a wild pitch for the first run of the third, with a Nate Berzonski ground out two batters later giving Maryland a 6-5 lead. Stephen Wade then singled in two runs with two outs. D.C. used four different pitchers in the game, none lasting more than two innings. Dejuan Taylor was the starter, tossing 63 pitches in the first two innings. He gave up eight runs, but just three of them were earned, thanks to three errors from the defense behind him. It was a struggle for Rocco Gilbert out of the bullpen in the fifth and sixth innings, as he gave up eight runs on seven hits in that stretch. Loring was the big hitter in the game, going 4-for-5 with two RBI and three runs scored. Gardner had a solid game at the plate as well, knocking three hits, driving in two and scoring two. In all, eight Maryland batters tallied at least one RBI in the game. Jibril Scott led the D.C. offense. He went 4-for-4 with two runs scored. Solomon McKinney was the only other Washington player with multiple hits, going 2-for-3 with two RBI. With the win, Maryland will move on to play the Delaware vs. Pennsylvania winner Thursday. The all-stars will have to win Thursday, Friday and Saturday to capture the regional title. Posted in The Bristol Press, General Sports on Tuesday, 7 August 2018 20:35. Updated: Tuesday, 7 August 2018 20:37.